By Jeffrey Gramlich, Ph.D., and Kimberly Houser, J.D. As of this writing, 23 states and the District of Columbia permit the sale of medical marijuana, and four states permit recreational use of the drug. However, because marijuana is still classified as a Schedule I controlled substance, its sale remains illegal under federal law. Taxpayers that engage in illegal activities are allowed to deduct otherwise allowable expenses incurred in the activity in calculating taxable income unless a specific provision prohibits a deduction for the expenses. Sec. 280E, enacted well before any states had legalized marijuana, prohibits the deduction of expenses incurred in a business of trafficking in a controlled substance; therefore, the businesses selling marijuana generally cannot deduct their expenses. However, this prohibition does not apply to deductions for costs of goods sold. Businesses that sell marijuana and also engage in other activities that do not involve the sale of marijuana may be able to take all otherwise allowable deductions for these other activities. It is currently unclear whether CPAs could face federal criminal prosecution for providing tax services to businesses in states where it is legal to sell marijuana and whether doing so violates state codes of conduct for CPAs. This article examines the unique income tax issues that are faced by regulated marijuana businesses and their CPAs. According to Marijuana Business Daily, "the federal tax situation is the biggest threat to [medical marijuana] businesses and could push the entire industry underground." 4 While other taxes, such as excise and sales taxes, are also of direct concern to these businesses, this article does not address them. For example, in James, 13 the Supreme Court held that because an embezzler had no obligation to repay embezzled funds, the stolen money would fall under Sec. 61(a), which taxes "all income from whatever source derived." The Court explained that the term "gross income" refers to both lawful and unlawful gain. In reaching this conclusion, the Court recounted the language in Rutkin 14 that there "has been a widespread and settled administrative and judicial recognition of the taxability of unlawful gains of many kinds." rentals or other payments required to be made as a condition to the continued use or possession, for purposes of the trade or business, of property to which the taxpayer has not taken or is not taking title or in which he has no equity. The ability to deduct business expenses under Sec. 162 is limited to those types of expenses that are not expressly excluded. While illegal businesses may report income, take many business deductions, and pay income taxes, certain exceptions exist in the Code. Examples of these nondeductible exceptions under Sec. 162(c)(1) include illegal bribes and kickbacks and payments to foreign governments under the Foreign Corrupt Practices Act of 1977. 17 Sec. 280E, which contains the exclusion that affects marijuana businesses, disallows businesses "trafficking in controlled substances" from deducting their regular business expenses. Sec. 280E penalizes traffickers of controlled substances by denying deductions from gross income for business expenses. However, as noted in the Joint Committee report, 19 to preclude possible challenges on constitutional grounds, Sec. 280E does not prohibit adjustments to gross receipts for the cost of goods sold. Ultimately, however, as noted above, one type of business expense deduction is allowed under Sec. 280E: cost of goods sold. This was affirmed in the 2012 Tax Court case, Olive. 22 The Olive case involved a San Francisco medical marijuana dispensary that did not provide caregiving services. The dispensary had its business expenses disallowed because of Sec. 280E but was permitted to deduct its direct costs of goods sold. 23 In disallowing the business expenses, the court rejected the argument that California state law permitting the sale of medical marijuana overrode federal tax law. While the court disallowed some costs-of-goods-sold deductions, this was because of a lack of substantiation for the expenditures, not because of the nature of the expenses. In a 2007 case, Californians Helping to Alleviate Medical Problems (CHAMP), 24 the Tax Court allowed business deductions for the "patient care" portion of a medical marijuana dispensary in addition to the firm's costs of goods sold. CHAMP was a not-for-profit entity under California law with a mission to provide caregiving services to members of the community with debilitating diseases. The organization charged a fee to its members for caregiving services that included providing limited amounts of medical marijuana. The caregiving services also included support groups, lunches for low-income members, hygiene supplies, counseling, massages, social events, field trips, and online computer access. The Tax Court agreed with the taxpayer's assertion that its primary business was the provision of caregiving services. As such, business deductions under Sec. 162(a) for the caregiving portion of the business were permitted, and Sec. 280E would not prohibit these deductions "simply because the taxpayer was also involved in trafficking in a controlled substance." The Tax Court further stated that the IRS regularly permits a taxpayer to engage in more than one business unless the separate characterization is artificial or unreasonable. 25 The court relied on the 1943 Supreme Court case, Heininger, 26 quoting the following language: "It has never been thought . . . that the mere fact that an expenditure bears a remote relation to an illegal act makes it non-deductible." Because of the taxpayer's ability to substantiate the business expenses, despite the fact that they were not specifically allocated to one aspect of the business or the other, the court took it upon itself to apportion the expenses, allowing those pertaining to legal activities and disallowing those for illegal activities. Some marijuana businesses looking to reduce their taxable income have sought to allocate indirect costs to inventory and, upon sale, to deductible costs of sales. On Jan. 23, 2015, the IRS Office of Chief Counsel issued Chief Counsel Advice (CCA) 201504011 to clarify its position on this type of allocation. The final substantive paragraph of the CCA distinguished between the activities of trafficking marijuana and producing marijuana. While Sec. 280E clearly precludes a Sec. 162 deduction for ordinary and necessary business expenses related to trafficking marijuana, the CCA allows a cost-of-sales deduction for indirect production-related business expenses. In particular, the CCA conceded, at least temporarily, that production-related wages, rents, and repair expenses are appropriately allocated to cost of sales and can be deducted upon the sale of the inventory by accrual-basis taxpayers (or immediately by cash-basis taxpayers). Marketing and general business expenses, however, remain nondeductible. to the extent, and only to the extent, such costs are incident to and necessary for production or manufacturing operations or processes. Thus, the list of indirect production costs that are properly allocable to inventory is considerably broader than the "wages, rents, or repair expenses" cited as examples of deductible expenses in the CCA. Given this list of additional costs that could be deductible, the tax savings of producing GAAP financial statements may well justify the cost of preparing them. The CCA also explained the IRS's view on the effect of the Sec. 263A uniform capitalization rules on the determination of costs of goods sold for marijuana producers and resellers. Congress enacted Sec. 263A in 1986, four years after Sec. 280E. The IRS explained that while Sec. 263A requires taxpayers to capitalize some expenses that were deductible under the previous rules, Sec. 263A is a timing provision, and its enactment only affected when a taxpayer can deduct certain expenses, not whether those expenses are deductible or nondeductible. In particular, Sec. 263A(a)(2) states that "[a]ny cost which (but for this subsection) could not be taken into account in computing taxable income for any taxable year shall not be treated as a cost described in this paragraph." Accordingly, the IRS found that, reading Sec. 280E in conjunction with Sec. 263A, a taxpayer cannot obtain a tax benefit by capitalizing under Sec. 263A expenses that are nondeductible under Sec. 280E. Because the enactment of Sec. 263A did not change which costs could be deducted under Sec. 280E, the IRS concluded that a marijuana trafficker's inventoriable costs (i.e., the costs it can deduct as cost of goods sold) should be determined under the pre-Sec. 263A inventory-costing regulations under Sec. 471 that were in effect when Sec. 280E was enacted. To summarize, marijuana retailers can allocate to inventory and the cost of sales the invoice price of purchased cannabis, net of trade or other discounts, as well as the transportation and other costs necessary to gain possession of the inventory. The costs allocable to inventory are considerably greater for marijuana-producing activities and are potentially even greater for a marijuana producer for whom GAAP-basis financial statements are prepared. Finally, all fully substantiated caregiving costs appear likely to be deductible when the facts and circumstances reflect those in the CHAMP case. Exhibit 2 presents financial results, both under GAAP and for tax purposes, for four types of marijuana business activities that use accrual-basis accounting. 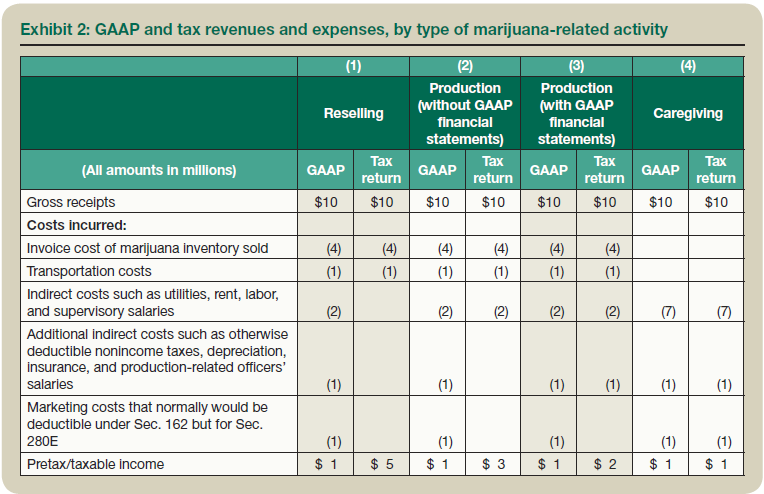 Columns (1), (2), and (3) provide examples of three inventory-based marijuana businesses that each produces $1 million of pretax GAAP income based on $10 million of gross receipts; $4 million of invoiced costs of marijuana sold; $1 million of costs of transporting marijuana to the business; $2 million of indirect costs such as utilities, rent, labor, and supervisory salaries; $1 million of other indirect costs such as nonincome taxes, insurance, and depreciation; and $1 million of marketing-related trade or business expenses that would be deductible, except for Sec. 280E. Column (4) provides similar figures for a marijuana-focused caregiving business, except that instead of $5 million ($4 million + $1 million) of direct marijuana and transportation costs, the caregiving activity incurs $5 million of additional indirect costs such as utilities, rent, labor, and supervisory salaries. Note that the CCA and CHAMP determine the deductibility of costs depending on the nature of the activity involved, and this appears unrelated to whether these activities occur within different taxable entities or within the same entity. All four activities generate $1 million of pretax GAAP income. However, taxable income differs between them. In the reselling activity depicted in (1), taxable income is $5 million because Sec. 280E allows only the deduction of direct costs of sales. Columns (2) and (3) portray the financial results of production activities that are allowed to deduct indirect costs of utilities, rent, labor, and supervisory salaries; they differ depending on whether the firm prepares GAAP financial statements. With GAAP financial statements, the example assumes that $1 million of additional costs, such as nonincome taxes, depreciation, insurance, and production-related officer salaries, are appropriately deducted as costs of sales. Without GAAP financial statements, taxable income is $3 million in (2), and with GAAP financial statements, taxable income is $2 million in (3). Under CHAMP, caregiving, even if marijuana-focused, is treated as any other trade or business for tax purposes. Thus, in (4), expenses are deductible to the extent they are justified under Sec. 162 and are appropriately substantiated, as indeed all costs must be in order to be deductible. Because all costs are deductible for caregiving activities, GAAP pretax and taxable income are the same, under the further assumption of no permanent or temporary book/tax differences. According to 18 U.S.C. Section 2(a), "Whoever commits an offense against the United States or aids, abets, counsels, commands, induces or procures its commission, is punishable as a principal." A 2011 memorandum from the U.S. Attorney General's office includes "those who knowingly facilitate [persons who are in the business of cultivating, selling, or distributing marijuana]" within a group that is in violation of the Controlled Substances Act. 33 Assuming an accountant or attorney knows that his or her client is in the marijuana business, as long as the sale of marijuana is illegal at the federal level, there is significant risk to the professional for aiding and abetting an illegal enterprise. What, if any, is the position of my State Board of Accountancy on CPAs providing services to marijuana growers/distributors? What are the legal risks of providing services to these businesses in my state? Is there a risk of prosecution to a CPA firm that provides services to marijuana-related businesses? What is the likelihood that the Drug Enforcement Administration (DEA) or the Department of Justice is going to prosecute this marijuana-related business? 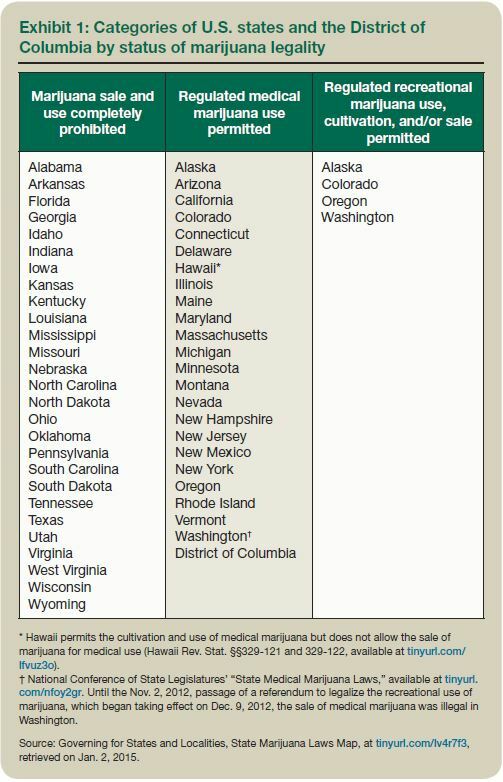 How are CPAs in my state currently offering services to state-recognized medical marijuana dispensaries? How will providing the contemplated services affect my malpractice insurance? How will it affect my professional liability insurance? What is the likelihood that I may be disciplined, sanctioned, or lose my license for providing services to these businesses? Of course, accountants are known for accepting new things only with caution. Perhaps their caution in this setting is warranted. Although CCA 201504011 provides more clarity regarding the extent to which marijuana businesses can deduct their business expenses, this issue will ultimately need to be resolved by Congress. Currently, incongruence prevails: Sec. 280E disallows expenses for "illegal" business activities that voters in several states have formally condoned. But before making a bold prediction that Congress will soon resolve the inconsistency, one should note that, despite federal contraband laws, medical marijuana business has been carried on in the most populous state, California, since 1996. CCA 201504011 clarified that, for resellers, costs that are otherwise nondeductible under Sec. 280E cannot be allocated to inventory and therefore cannot be deducted as cost of sales. But the CCA did throw one small bone to the emerging marijuana industry: indirect costs related to production, but not to marketing or general business activities, can be allocated to inventory and ultimately can become deductible as a cost of sales. And the list of deductible indirect costs is broader for a marijuana producer that prepares GAAP financial statements. Accountants, especially licensed CPAs, should exercise extreme caution in dealing with marijuana businesses that are legal at the state level but illegal at the federal level. Despite the recent dramatic changes in public perception of marijuana, as long as the sale of marijuana is illegal at the federal level, it is still a risky proposition for both the businesses and their tax professionals. It is very important for CPAs to check with their state board of accountancy and the AICPA for guidance. Possibly most critical, CPAs should carefully read the caveats of their professional liability insurance policy, especially those that may pertain to knowingly providing services to clients that violate a federal criminal statute. 1 See National Conference of State Legislatures, "State Medical Marijuana Laws." 3 21 U.S.C. §801 et seq. (enacted Oct. 27, 1970). 4 "Marijuana Business Conference Wrapup: 36 Tips, Lessons & Takeaways for the Cannabis Industry," Marijuana Business Daily (Nov. 15, 2012). 5 Comprehensive Drug Abuse Prevention and Control Act of 1970, P.L. 91-513 (Title II is known as the Controlled Substances Act). 6 21 U.S.C. §§812(b)(1) and 812(c), Schedule I(c)(10). 7 Marijuana Policy Project, "Federal Enforcement Policy on State Marijuana Laws." 8 Flatow and Diebold, "Feds Raid Washington Medical Marijuana Dispensaries," ThinkProgress (July 25, 2013). 9 Colo. Rev. Stat. §§39-22-104(4)(r), 39-22-304(3)(m). 10 Kuntz, "Marijuana Profits Up in Smoke Under IRS Rules," USA Today (Nov. 5, 2014). See also Crellin, "A Law Designed to Target Coke Lords Is Screwing Over Legal Pot Companies," Vice News (Nov. 4, 2014). 11 Letter from Andrew J. Keyso, deputy associate chief counsel, Internal Revenue Service (Dec. 16, 2010). 12 Chief Counsel Advice 201504011, at 2. 13 James, 366 U.S. 213 (1961). 14 Rutkin, 343 U.S. 130, 137 (1952). 15 Tellier, 383 U.S. 687 (1966). 16 Id. at 691 (1966). 17 Foreign Corrupt Practices Act of 1977, P.L. 95-213. 18 Joint Committee on Taxation, General Explanation of the Revenue Provisions of the Tax Equity and Fiscal Responsibility Act of 1982, p. 264 (Dec. 31, 1982). 20 Edmondson, T.C. Memo. 1981-623. 21 Joint Committee on Taxation, General Explanation of the Revenue Provisions of the Tax Equity and Fiscal Responsibility Act of 1982, p. 264 (Dec. 31, 1982). 22 Olive, 139 T.C. 19 (2012). 23 Id. at fn. 19. 24 Californians Helping to Alleviate Med. Problems, Inc.,128 T.C. 173 (2007). 25 Id., slip op. at 18. Regs. Sec. 1.183-1(d)(1) provides, "The taxpayer's characterization will not be accepted, however, when it appears that his characterization is artificial and cannot be reasonably supported under the facts and circumstances of the case. If the taxpayer engages in two or more separate activities, deductions and income from each separate activity are not aggregated either in determining whether a particular activity is engaged in for profit or in applying section 183." 26 Heininger, 320 U.S. 467, 474 (1943). 27 Banks reportedly do not wish to run afoul of federal laws against aiding or abetting (18 U.S.C. §2(a)) or money laundering (see, e.g., Richtel, "The First Bank of Bud," The New York Times (Feb. 5, 2015)). 28 See, e.g., IRS, Cash Intensive Business Audit Techniques Guide (April 2010). 29 Boyette and Wilson, "It's 2015: Is Weed Legal in Your State?" CNN.com (Jan. 7, 2015). 30 Sullum, "Gallup Poll Finds 58% of Americans Support Legalizing Marijuana," Reason.com (Oct. 22, 2013). 31 Steinmetz, "Christian Marijuana Dispensary Reconciles Dogma and Dope While Battling the IRS," Time (Feb. 26, 2014). 32 See Canna Care, Inc.,Dkt. No. 005678-12 (Tax Ct. 3/6/12) (petition filed). 33 Memorandum for United States Attorneys from James M. Cole, deputy attorney general, "Guidance Regarding the Ogden Memo in Jurisdictions Seeking to Authorize Marijuana for Medical Use" (June 29, 2011). 35 Wooten, "Tax Practice: IRS Guidance Coming for Practitioners Preparing Returns for Marijuana Retailers," BNA Daily Tax Report (Nov. 20, 2014). 36 AICPA, Colorado Society of CPAs, and Washington Society of CPAs, An Issue Brief on State Marijuana Laws and the CPA Profession (May 16, 2013, updated Jan. 5, 2015). Jeffrey Gramlich is a professor and director of the Hoops Institute for Taxation Research and Policy at Washington State University’s Carson College of Business in Pulliam, Wash. Kimberly Houser is a clinical associate professor of business law, also at the Carson College of Business at Washington State University. For more information about this column, contact Prof. Gramlich at jeff.gramlich@wsu.edu.